Real estate site Zillow.com has ranked the District as #10 on its list of top 20 cities for trick-or-treating, and includes its five best neighhorhoods for your... um, we meant, your kids' optimum candy haul. "There is a common belief that wealthy neighborhoods are the Holy Grail for harvesting the most Halloween candy," Zillow notes. However, to provide the best overview, the site says it calculated its Trick-or-Treat Index using four variables: Zillow home value index, population density, walk score and local crime data. 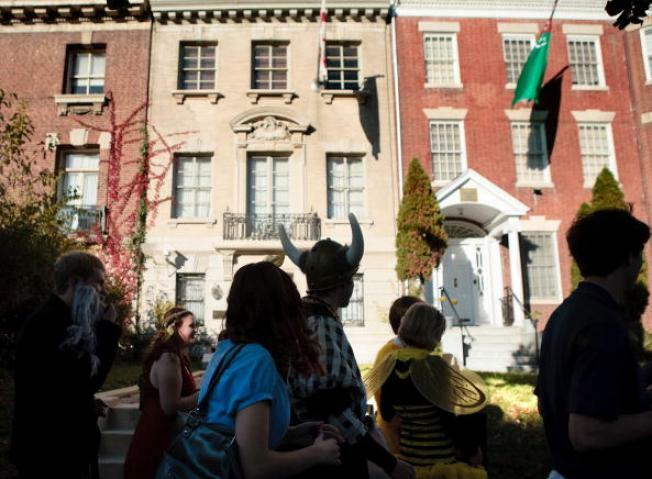 Of course, Kalorama includes Embassy Row, long a top destination for trick-or-treaters in this city. But now armed with additional vital information, will candy-seekers journey forth in search of more and better goodies? Maybe, maybe not. A very (...very, very) informal poll of NBC Washington's users on Facebook indicates that most people prefer to stay close to home. "Home is where the heart is (and the knowledge of the best houses for candy! ...for the kids of course! )," wrote Scott Cota. Dawn Eberly Wampler told us, "I prefer our own neighborhood and neighbors that we know..."
But Lori Corby-Brown wrote, "Our neighborhood is too dark and rural... We always go to a development in town." We would now like to suggest Kalorama. Or Chevy Chase, or Georgetown, apparently. Just sayin'.